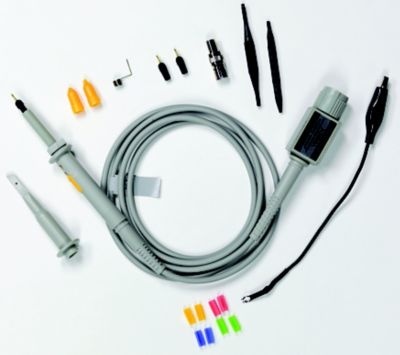 The Keysight N2889A low-cost passive probe provides up to 350 MHz bandwidth and features a high input resistance of 10 MΩ (@10:1 mode) to address a wide range of measurement needs with low probe loading. The N2889A provides a switch in the probe handle that allows to choose the attenuation ratio between 1:1 and 10:1. The probe can be adjusted for low-frequency compensation and high-frequency compensation. For the best measurements you should compensate your probe to match its characteristics to the oscilloscope.